There is an interesting class of programs: audioplayers. What we expected from them? Playing music. What is required for this? Codecs, simple interface, playlist, equalizer. May be themes and control from keyboard. Many things can be applied to it, but audioplayer must stay a-music-player. This is primary task for such kind of program, and afterwards -- cataloguer, tag converter, music collection organizer and so on. For this, spartanians and ancient-lovers remembers and likes simple yet powerful XMMS. There is many a good tune played on an old fiddle..
After that, music can be copied into directory, and tags can be converted by another software, such as EasyTag. I like XMMS for incredibly speed of loading songs with tags: more than 400 music files are loaded with less than 6 seconds with alphabet sorting. And I`m don`t remember about it anymore -- XMMS is minimized to tray and controlled by multimedia keyboard. xmms-alarm -- xmms general plugin for using xmms as an alarm clock. xmms-blursk -- Powerful visualization plugin for XMMS, similar to "Blur Scope"
xmms-cdread -- for AudioCD reading. xmms-crossfade -- makes song to be faded slowly at the end and at the beginnig. xmms-flac -- support of FLAC sound format. xmms-skins -- this package consists of themes, so you should install it. xmms-status-plugin -- permits to control XMMS, when it minimized to tray. xmms-xf86audio -- controlling XMMS via keyboard: now multimedia keys on keyboard will be played in full power! There are more plugins -- xmms can be tweaked for your comfort simply. Of course, XMMS have contras -- there no silver bullet. GTK1 menus are so ugly, that CompizBeril-lovers can harm their gentle psychology. But, as mentioned earlier, you wanted simple yet powerful player? Here it is! And it`s better than looking at Ubuntu dialog box "for music playing, loads of codecs are required". And here it`s playing and singing. This post was inspired by questions on forums. And dear commentators, don`t throw addle vegetables in me: I really like XMMS, like MC. The original post is HERE. Program is alive until at least only one human uses it. Thus, XMMS is live. Open source will forever alive..
Well, it’s alive, but has been abandoned for lack of a maintainer in Debian. I am also a big fan of XMMS, but have found that after I recently installed my new laptop (with Debian testing, upgrading to unstable), I was unable to install XMMS. It is in the stable tree, been even when adding stable to my sources, it ends up with unresolvable dependency issues. The root of the problem is that it is requiring a newer libglib1.2 than exists in any of the trees. So in Debian, yes XMMS is dead until someone picks it up and becomes a maintainer. There is a fork (?) named audacity, that is available in lenny. There is also xmms2, but thats a demon that wants to manage a media library – I did not look closer look at it as it is not simple. 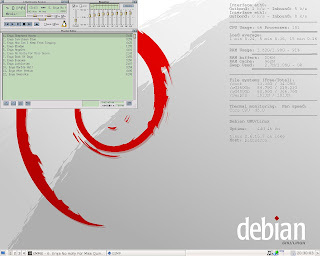 i want my good old xmms back in debian.. .
yep Mark, i got that backport. .however i am missing all the extras like flac support, i can’t remember the others, maybe i just stopped listening to music as much since xmms is dying.. . I tried that backport myself, and found that I was unable to get it going as regular user (it did work as root, though). So, I’m just going to use moc. I tried audacious, and did not like it — it seemed to just have too much stuff for my liking. Alas, I too wish that xmms was back in Debian. your issues seems a bit odd, are you in audio group (i assume so), did you check you audio mixer (aumix, alsamixer), they can sometimes for some reason be muted after doing $things.. .
serial 1505 error_code 8 request_code 72 minor_code 0”, when I tried to run it as a normal user. Apparently (according to another poster at linuxquestions.org) this is a known issue with xmms. It’s further described at http://bugs.debian.org/cgi-bin/bugreport.cgi?bug=318582 This, I suspect, is likely one of the reasons that xmms was removed from Debian. this issue you have interest me a bit, i will attempt to install xmms on a fresh install just to see. if you would like to continue our discussion i’d be happy to do so via standard email.. (link to my site => contact and then we’ll see from there).. Anyway, I have moved onto audacious, and am slowly getting used to it.